Here we are, my final projections for what has been, essentially, the most boring election I've covered. Sorry Albertans, but that's the truth. Except for some movement at the very beginning of this campaign, nothing changed. Sure, some polls were showing a bigger or smaller lead, but the average barely moved and very few seats are competitive. With that said, I have to admit that Alberta has different topics of discussion between parties than the rest of the country (pipeline!) and it's interesting in itself. As soon as the PC and Wildrose merged into the United Conservative Party, it was all but guaranteed the NDP of Rachel Notley wouldn't be able to stay in power. And guess what? These final projections have the UCP overwhelmingly favorite. It really isn't close and it'd take a monumental polling failure for Notley to remain Premier. Here are the projections, including the chances of winning and a 95% confidence interval for the seats. By the way, friendly reminder that you can use the model yourself and make your own projections, here. Sorry no time for riding by riding probabilities. I just had time to write the new R code (I switched to R) for the province-level stuff. As mentioned above, the average has barely moved. Sure the NDP caught up to the UCP right at the beginning (when people starting paying attention) but the NDP was never ever close during the entire campaign. Jason Kenney not being particular good as leader (or particularly liked) probably made this election slightly more competitive than it ought to be. 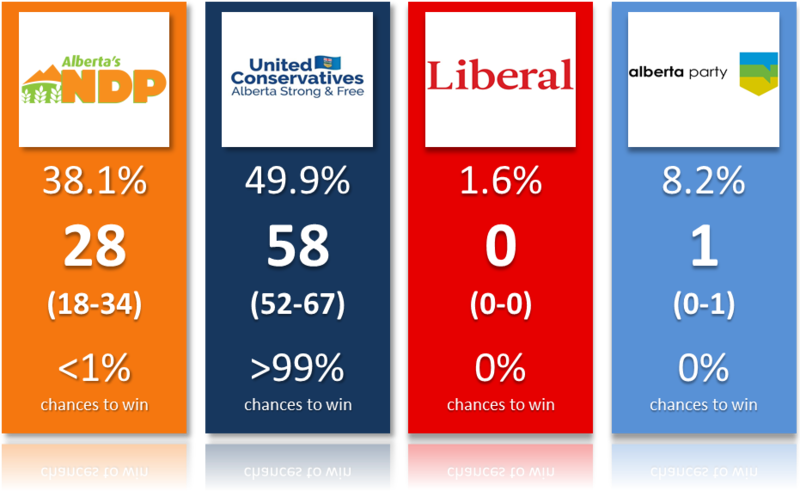 There is still one scenario that would see Notley remaining as Premier (see below) and while the polls kinda indicate this scenario is possible, it is far from likely. Overall it seems the situation hasn't changed much compared to 2015, although there could be cancelling within province variations. The only party clearly up is the Alberta Party while the Liberals have almost completely disappeared. There is one possibility for the polls to be wrong: if the turnout ends up changing everything. We have seen in the past, including in 2012 in Alberta, how a change in turnout can often lead to polling failures. Advance voting has been going like crazy in Alberta, with over three times as many votes as in the advance voting of 2015. While this might indicate an increase from the 57% turnout of 2015, we should also remember that advance voting has been on the rise everywhere. More and more people are taking advantage of the possibility of casting their vote early. Also, this year in Alberta, people could even vote in advance from anywhere in the province. There was also one extra day. So more opportunities to vote early. I'll also add that the most people vote early and the more committed they likely are, which decreases the chance the polls are wrong (in 2012 for instance, it seems many people made up their mind at the last minute). So while I'm expecting an increase of turnout, I also don't think it'll be crazy. In BC in 2017, advance turnout was 62% higher than in 2013 but the final turnout barely went up by 5%. So I'm betting on a 65% turnout, just below the 2015 federal election. Yes, that is mostly a guess (educated one maybe?). The bigger question is: who will it benefit? Many often assume that a higher turnout means the left will win. But that's not always that simple. Ford won a large majority in Ontario after a 7 points increase in turnout. In Alberta, there was a sharp jump in 2012 and that coincided with an explosion of the vote for right-wing parties (PC and Wildrose combined). So, what about this year? The truth is that I have no idea. Election Alberta hasn't released the advance turnout by riding (I asked, trust me). So it doesn't allow us to look for patterns like I did in Quebec (where we could see the Liberal vote staying home). I'll add one thing: in 2015, it seems fairly evident that some conservative voters stayed home for the provincial election but came out for the federal one. So the increased turnout could be, at least partially, from them. If I had to guess the impact of the turnout, I'd guess it'll help both the NDP and UCP. I don't believe it'll make a big difference at the provincial level. It will, however, likely make the difference in some key races in Calgary or the Edmonton suburb and my model will be wrong there. Oh well, not much I can do if the data isn't even published. Using Google Trends, if we look for the parties (UCP and NDP), that gives us pretty much a tie. It's always hard to use Google Trends for anything meaningful but I'll say that I don't see anything that would indicate a surprise NDP victory (given that younger voters are more for the NDP, if the NDP was actually ahead, I'd expect this party to clearly dominate on Google Trends). Kenney doesn't seem like the most popular leader but neither is Notley. Google Trends show no clear advantage for either of them. There is a desire for change in Alberta but nowhere near what we saw in Quebec, Ontario or BC in 2017 where over 70% of the voters wanted a change of government. It really just seems the conservative people from this province, who are clearly a majority, want their conservative government back. That's logical. As for the age breakdown, Millennials and Gen Z (so the 18-34) are much more likely to vote NDP. An increased turnout of that age group would definitely help, but it will likely not be enough to compensate the huge margins for the UCP among the 55+. With that said, my projections have the NDP winning mostly the same parts of Calgary as the federal Liberals in 2015 and the Millennial/Gen Z vote will likely have an impact there. By the way, my polling average is calculated using all the polls (one per firm) of the last week, with equal weight (you can waste your time trying to give different weights based on sample size and the sample being one freaking day older, but at the end of the day it doesn't matter much. I consistently beat other sites doing complex averages with my simple rules and I see no reason to change). I haven't allocated undecided proportionally. Instead I have split them 50-50 between the NDP (incumbents are often underestimated) and the UCP (main party; Plus the PC was systematically underestimated in Alberta in the recent past, including in 2015). I have also adjusted the Liberals, Green and Freedom Party down since they aren't remotely running a full slate of candidates. This explains why both the NDP and the UCP are higher in my average than in the polls. Additionally, I calculated the swing from the 8 riding polls from Mainstreet and I extrapolated the province-wide percentages based on them and did an average with my other numbers. Since these riding polls were slightly more negative for the NDP and slightly better for the UCP (it would give province-wide numbers of over 50% for the UCP and close to 36-37% for the NDP), that explains why I have the UCP higher than in the regular polls (although I don't really have this party higher than the last few polls published it seems, including the latest Forum). By the way, let's remember that 2018 was a terrible year for Canadian polls. They were off in Ontario (underestimated significantly the lead of the PC, at least in average), got so, so off in Quebec (mostly because English-speaking voters didn't get out to vote) and there is also the infamous BC referendum on electoral reform where polls were dead wrong. So we'll see tomorrow if 2019 will start better. But note that in all these situations, the polls underestimated the right-wing option. The real question on Tuesday, at least according to me, will be whether the UCP goes above or below 60 seats. Honestly, it seems pretty simple to make projections for this election: the UCP will quasi-sweep the rest of Alberta with communist majorities. Edmonton (core) will likely remain NDP, the suburbs will be a fight. The real battleground is Calgary. This is where most of the competitive seats are and where a surprise could come from. Now is a good time to go back to this one scenario that would allow the NDP to remain in power. The NDP needs a couple a things. First of all, it needs the polls to be wrong. In particular it needs the polls to be wrong in Calgary. Polls are showing the UCP ahead by about 12 points in average. Some firms have them closer, like Mainstreet (but Mainstreet and Calgary might not necessarily be the best match if you remember the mayoral election last year...). The NDP also needs to make its vote way more efficient. That means not winning in core-Edmonton by as much and instead transferring those votes to the suburbs or Calgary. So, ideally, the polls would show the NDP down in Edmonton and in the rest of Alberta (won't matter there) and up in Calgary. And they are showing that! Just not by a big enough margin to allow Notley to win the most seats. The path to victory for the NDP is incredibly narrow because the right merged. Let's not forget that a united right would have won in 2015 (at least based on the results; Obviously it could have been a very different campaign). So the NDP needs to do better than it did during a perfect-conditions year. You don't need an excel spreadsheet to see how hard it is. It's already remarkable that Notley is polling so close to her 2015 number. I never thought that would happen. So the path involves the NDP sweeping Edmonton like in 2015: 26 seats. Then it needs to win another 14-15 seats in Calgary. The NDP won 15 in 2015 against a divided right. The projections currently give the NDP 5 seats there (at the center of the city, the same area the federal Liberals won in 2015). Can it get the extra 10 needed? It's tough and this is where the polling failure will be required. Basically, the NDP needs to win the popular vote there instead of trailing by 12 points. We are talking about a fairly major polling mistake. Since Calgary represents roughly 1/3 of the riding, an underestimation of the NDP by 7-8 points there will mean the NDP should finish at least 2-3 points above its provincial numbers. So that means the NDP beating its results of 2015. And please realize that even if this happens, the UCP would still likely win. That would particularly be the case since the NDP being down in Edmonton would cost them some seats in the suburbs. So really, the NDP needs the polls to be right in Edmonton and wrong in Calgary. And then it needs some wins elsewhere. So 26+14+3=43, maybe just enough to keep power in a very unstable assembly (would likely require the speaker to be the sole AB elected member). Is all of this possible? Sure, but it isn't likely at all. Far from it. Also, since we are talking of uncertainty and surprises, keep in mind it goes both ways. That means the UCP could end up way over 50%, winning pretty much all of Calgary (the NDP's seat aren't projected to be safe there unless we get the massive polling failure we just discussed), most of Edmonton suburb and almost everything elsewhere. That would put the UCP way over 60 seats. This scenario is actually, at least to me, more likely than a NDP win. Why? Because the riding polls from Mainstreet (8 in total) have shown the NDP to be down and the UCP to be higher than provincial polls would predict. I mean, those polls have shown the UCP to be right behind the NDP in Edmonton McClung, ahead in Calgary-Elbow and right behind in Lethbridge West. Not a single one of those riding polls have shown the NDP more comfortable than expected. As a reminder, these riding polls were much better in Ontario and Quebec at measuring the overall swing. We did get a lot more of those polls back then however. As for the Liberals and Alberta Party, well the former has completely collapsed and will likely not elect a single MLA. The Liberals leader, Khan, seemed to have done an okay campaign and might win his seat (he took the riding of the only Liberal win in 2015) but I'm doubtful. The Liberals are only running 51 candidates, which means their actual percentage of votes will almost surely be less than what the polls predict. The Liberals are running everywhere in Calgary however, which isn't helping the one-dream scenario of the NDP. As for the AB, logic and numbers would dictate that they'd at least keep their seat in Calgary-Elbow, although a Mainstreet riding poll there showed the UCP candidate ahead. Oh, technical notice but I assumed that UCP was 90% of PC+Wildrose. The remaining 10% went to the Freedom Party and people simply not voting. I assumed (and based on some polls I found) that no merger is ever 100%, so that made sense. With that said, this is a very successful merger. Finally, there is no chance of a minority since really only two parties are projected to win seats. Although BC managed to get one in 2017 in a similar unlikely scenario, but the third party won 3 seats. I can't see the Liberals and AB winning 3 seats tomorrow. Well, that's it for me. I'm sorry if I didn't cover this election as much as I had done for the Ontario and Quebec election, but the timing wasn't optimal for me (end of term, so exams, etc). Plus, the fact the race seemed so uninteresting didn't help.